Polish and make old, rusted Brass, Copper, Tin, Chromium, Stainless Steel and Nickel to new. 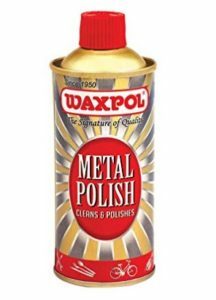 Buy Waxpol Metal Polish – 200 ml worth Rs.115 at Rs.57 only at Amazon. Polish for High Gloss on Brass, Copper, Tin, Chromium, Stainless Steel and Nickel. Not for use on Metalized Plastic, Vinyl Tops & simulated Wood. Polish Faucets, Fixtures, Musical Instruments, Auto Chrome, Metalware, Watches, Showpiece, Antiques, Sign Boards, idols etc at Home, Hotels, Automotive Boat, Aircraft etc. Removes Tarnish and Discoloration to restore natural colour lustre and shine.